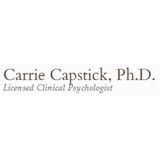 Carrie Capstick, Ph.D. (New York) - Book Appointment Online! I’m a clinical psychologist in private practice on Manhattan’s Upper East Side. I have over 18 years of clinical experience and work with adults, adolescents and couples on a variety of issues, including: Relationship problems Depression Anxiety and panic Sleep difficulties Low self-esteem Body image concerns and eating disorders Job stress and problems with work/life balance Chronic feelings of dissatisfaction We all experience difficult times in our lives, whether it’s because we’re unhappy with ourselves or unfortunate things happen to us. Therapy offers a safe, honest partnership to help us understand what we’re experiencing, to identify our problematic life patterns, and to find ways to move forward. I've been seeing Carrie for a year now. She has helped me tremendously. It's a pleasure "working " with her. Besides being very professional she's also a very nice and friendly person. I am extremely happy with Carrie and would recommend her to anyone who needs help.